You are ordering a desk appraisal, this is a report that takes into account the information you’ve provided to us and not a physical inspection done by us. 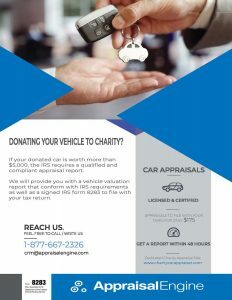 Charity Car Appraisal Website Redesigned to Offer Better User Experience for Clients Requesting Valuation Reports on their Donated Property. True Vehicle Value Re-branded Charity Site is Now Live. straightforward, uncomplicated way to order a charity appraisal for their donated vehicle.